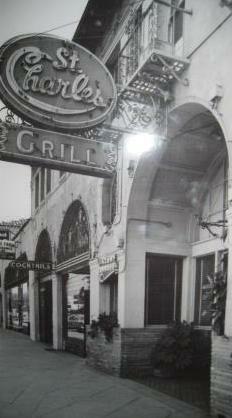 In its day, the St. Charles Grill was one of the finest restaurants in Pomona. Located at 158 W. Holt Ave., a half-block west of Garey Avenue, the restaurant served steaks, chops, lobster and other delicacies, waited on celebrities passing through town (as they did in the pre-freeway era) and hosted service clubs and wedding receptions in its banquet room. There were even some apartments rented out up above. St. Charles Grill opened in 1930 and faded out in the late 1960s or early 1970s. The space reopened as Alpine Haus (!) in 1973 and as Lucier’s in 1979. (Thanks to the Pomona Public Library for the names and dates.) The building has been vacant for many years and is currently for lease sale. I’ll be writing a column about the place in the near future. You’re encouraged to comment here with any memories of the St. Charles — the food, decor, atmosphere, staff or whatever else you’d care to share. Wednesday’s column (read it here) is based on Monday’s Upland City Council meeting. I didn’t think I had gotten much out of the meeting, but once I was writing the column Tuesday morning, it turned out I had more material than I’d thought. So, it made for another full-length essay out of an Upland meeting. A Harvey Mudd College senior, Palmer Mebane, has won the 2011 World Puzzle Championship in Hungary, which the school says makes him the first American winner in 12 years. He beat a seven-time champ from Germany. Mudd’s writeup is here. Mebane doesn’t do crosswords but rather logic puzzles. You can find a bunch on his blog. I took a look at a couple and my brain almost exploded. Thankfully I averted my eyes in time. Headed to San Bernardino’s National Orange Show recently, I was delighted to pass by a bowling alley. I made a stop on my way back. 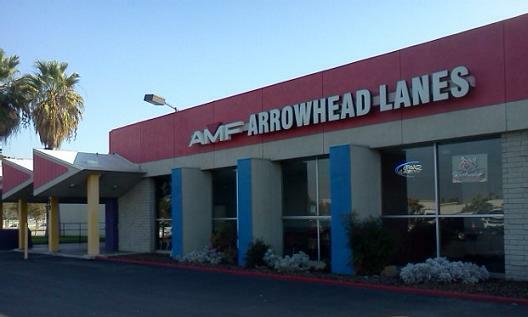 And speaking of way back, Arrowhead Lanes is a pleasant throwback. The scoring machine looks like something from the bridge of the Starship Enterprise, and it must baffle newcomers, because the woman at the counter routinely asks if bowlers would like her to enter their names for them. Meanwhile, the ball return sends balls into a teardrop-shaped bin where they swirl around like thoughts in Herman Cain’s head. 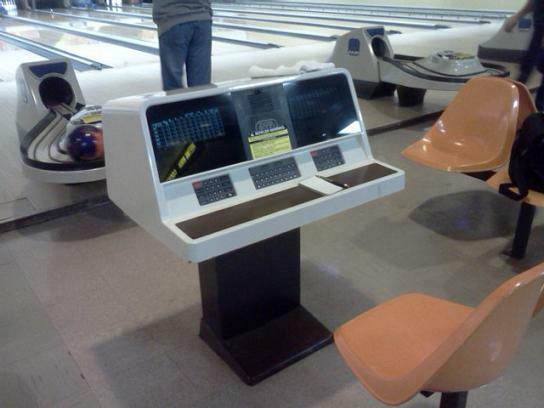 The monitors above the lanes give you your score and nothing else — no fancy graphics, no ads. Helpfully, if you bowl multiple games, it shows you the same frame from each game, so you can instantly compare, say, your fourth frame from this game to your previous two. 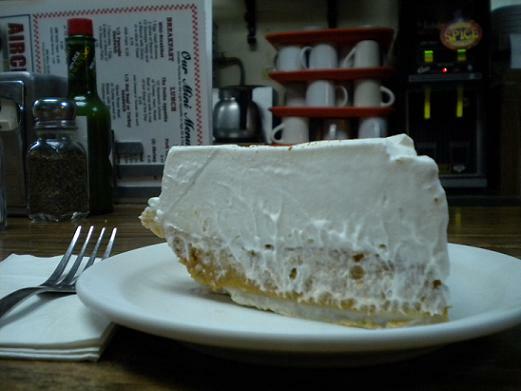 A slice of pumpkin supreme at Flo’s Airport Cafe, Chino, shot as I occu-pied a seat at the counter recently. I visit once a month for a slice of pie. To save the drive, maybe I should pitch a tent in the parking lot. I’m a little sheepish about these (perhaps rightfully so?) and slipped this one into print on a holiday weekend when news is scarce and many readers are probably otherwise occupied. I figure most of you dedicated enough to read my blog will think it’s perfectly fine that I throw away a column now and then on a personal interest, but feel free to condemn me or buck me up. I’ve written two or three Twain-related columns before (after “Roughing It” and “Connecticut Yankee”) and will likely produce a handful more in the next few years, assuming I keep reading him as I intend to. Sheepish or not, in retrospect I wish I’d written one after reading “Life on the Mississippi,” which may be my favorite so far. Friday’s column (read it here) isn’t anything weighty, under the theory that almost no one is reading the paper today. I compiled three items sent in by readers, all inessential but all fun. Enjoy (if you’re reading)! In my latest controversial holiday-related post, I’d like to wish you all a happy Thanksgiving. What am I grateful for this time of year? I would say my job, my readers, comic books and pie, not necessarily in that order. What are you grateful for? Let us know by posting a comment. We’d be ever so thankful. 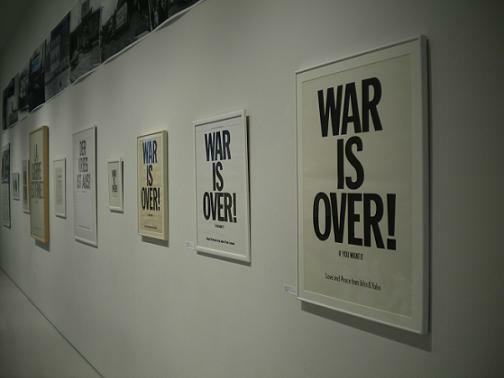 Wednesday’s column (read it here) concerns an art exhibit in La Verne, of all places, devoted to John Lennon and Yoko Ono’s peace activism, of all things. 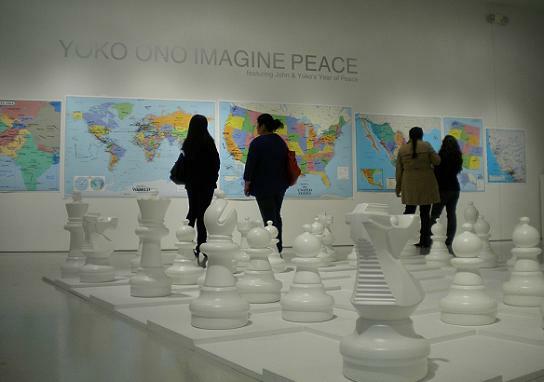 “Imagine Peace” is at the Harris Art Gallery. Hours and such are here. I arranged to visit Monday, and I’m awfully glad I did. Of course the price is right (admission is free) but it’s also a neat exhibit for John and Yoko fans. I’m enough of a fan that in reading the exhibit booklet it jumped out at me that (on p. 32) Yoko’s daughter Kyoko is referred to as Kyoto. Please. We all know the name of Yoko’s daughter by her first husband, right? The city has no obvious connection to the Beatles, although it’s a little-known fact that “Ob-La-Di, Ob-La-Da” was originally to be titled “Ob-La Verne-Di, Ob-La Verne-Da.” Just kidding. 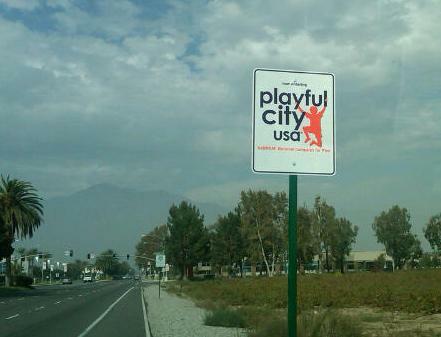 Rancho Cucamonga is not only the friendliest city in the Inland Valley (according to my newspaper’s unscientific reader survey) and a Tree City USA, it’s also an official Playful City USA, as this sign on Haven Avenue at 4th Street spotted by reader Bob Terry reveals. Check out the Playful City website. Anyway, looks like somebody’s jumping for joy.